With the beginning of the new year, I tried to give the new Skype a chance, so I removed the classic version and took the new one for a test. I promised myself I will be patient this time, even though it was immediately visible how incomplete the product was. Well, few weeks later and a newer version, I finally had enough of this crap. So back to Classic Skype then. I installed the latest version available and was immediately greeted with some login issues. Since the account I use is now associated with my Microsoft ID, and since I have two-factor authentication enabled on the account and actually configured Azure MFA as primary auth factor, after entering my username I received the familiar login prompt via the Authenticator app. Then, Skype simply started showing the progress indicator over a blank window. And keep doing this forever. No error message, no nothing. Talk about good user experience. While the description doesn’t specifically mention my case, the root cause is the same. 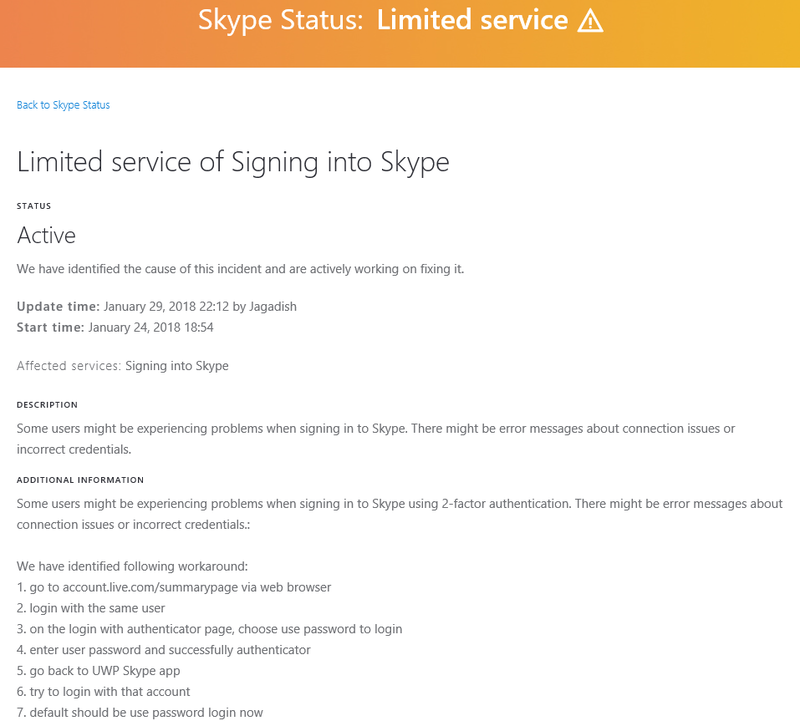 If you have your Skype account associated with Microsoft ID and have enabled Azure MFA as authentication provider for your Microsoft ID and using it as primary authentication, you will have to disable it. Which is done by accessing any page that will trigger the login process, apart from the IE instance hosted in the Skype process. Simply use your favorite browser, open a Private session to outlook.com or any other service associated with the Microsoft ID, and when prompted to login select the “Use password to login” option. This will reset the primary auth method and you should be good to go.